Tom Mohan’s side are the first to qualify for this summer’s tournament in Armenia. 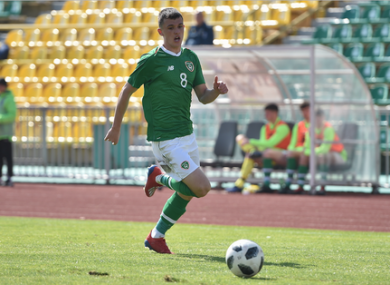 Jason Knight was one of Ireland's goalscorers against Azerbaijan on Saturday. IRELAND HAVE QUALIFIED for this summer’s U19 European Championships with a game to spare. Tom Mohan’s side seized control of qualifying Group 1 with a 3-1 win against Azerbaijan on Saturday morning. And when Russia were held to a 0-0 draw by Romania in the day’s other Group 1 game, it was enough to guarantee Ireland’s place at July’s finals in Armenia. Ireland join the hosts and become the first side to qualify for the eight-team tournament, where they will take their place in the finals for the first time since 2011. Then, a team which included current senior internationals Matt Doherty, Jeff Hendrick and John Egan made it all the way to the semi-finals before losing to eventual champions Spain. Ireland play Russia on Tuesday in their final elite round qualification match. Email “Ireland have qualified for the U19 European Championships for the first time since 2011”. Feedback on “Ireland have qualified for the U19 European Championships for the first time since 2011”.